Today the choices that are available for your roofing can be quite overwhelming. There are many different manufacturers and each of them offer several different designs when it comes to roof shingles in Michigan. On top of that there are man color choices as well as quality grades. It can make choosing the roof materials for your home difficult and some of the terms may not translate into what you may think. In this article we’ll take a look at two of the most popular types of roofing shingles that are offered by roofing manufacturers to help you better understand the differences in each and why it matters so much. More often than not, people will opt for asphalt shingles to use in their roofing due to their easy installation and low cost. Asphalt shingles are by far the most popular choice in the roofing industry, out-competing alternative options by leaps and bounds. In Howell Michigan, asphalt shingles are used more on residential homes more than all the other roofing material types combined. Considering the variety available in the two options of asphalt shingles, three-tab and architectural, it’s no wonder that they are the most commonly used product. 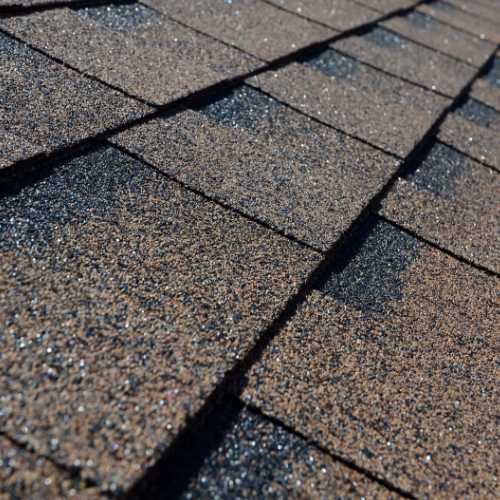 Three-tab shingles get their name based on the distinct look they have after installation that gives them the appearance of being three separate pieces rather than a single tile. This look is created by the cutouts along the lower edge of the tile, mimicking a look of three tiles in one. These popular tiles have been used for a long time and due to their economic availability, remain among the most popular roofing products. Architectural asphalt shingles don’t have the cutouts like the three-tab, but instead have a distinct additional laminated layer along the bottom of the tiles. This additional layer gives a three dimensional effect, creating a contoured architectural look, thus giving them the name. This additional layer also increases the waterproofing of the tiles, though it is recommended that these are not used for low sloped roofs due to their weather damage vulnerability. At first glance, it would seem that the two asphalt shingle options only differ in appearance and style. Experts actually consider the architectural shingles a step above three-tab and on the higher end of roofing products. This difference in what ends they are on can be seen in the cost differences between the two options. Three-tab shingles cost between 20-40% less than architectural shingles, making them a more cost efficient option for larger roofing projects. 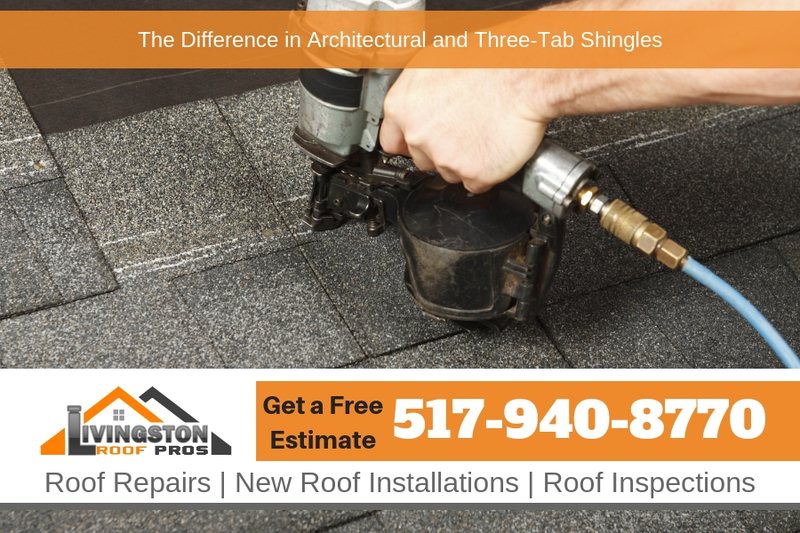 Lifespan – Architectural shingles are thicker than three-tab shingles, therefore they are less vulnerable to the typical damages that three-tab are subject to, such as curling. The added thickness of architectural shingles makes them more durable to various weather conditions, thus making them more protective of your home. Weather Resistance – Architectural shingles typically weigh around 340-440 pounds per square and receive a rating against wind speeds up to 80-120 miles per hour. 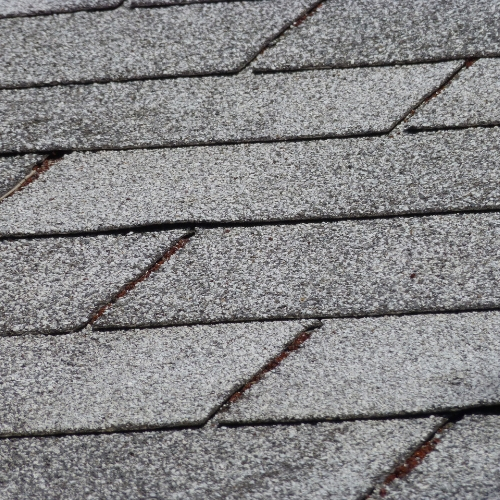 Compare that to three-tab shingles which weigh 240 pounds per square and are only rated for wind speeds up to 60 mph. Warranties – Put simply, architectural shingles just have a longer manufacturer’s warranty at 40-50 years versus that of three-tab shingles at 25 year warranties. Overall Style – Due to the dimensional effects that can be created by the use of architectural shingles, they can be made to produce high end looks, giving the illusion of having used high end roofing products to create the look. Architectural shingles can be made to look like cedar and slate, providing that high end look at a great quality and comparable price. Compared to three-tab shingles, architectural shingles also hide roof structure imperfections far better.